@BifBangPow: "Yes, and proud we are of all of them". 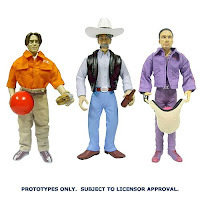 Normally, I have strong objections to the proliferation of cheap plastic crap from China, but I must make an obvious exception for your series of Big Lebowski Urban Achievers action figures. Your determination and perseverance to bring these products to the world is honorable, and affirms the idea that humanity is indeed on the path of progress. I salute you. Donny looks a little off... the other two are brilliant though! Can't wait to get my greedy paws on these!